Various requests by visitors to Henties Bay for information on the mineral occurrences in the area culminated in the Central Damaraland Minerals Trail. 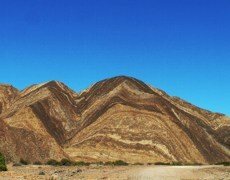 The trail introduces visitors to some of the wonders of the geology of the Namib Desert. It is further important to note that the mineral rights in Namibia vested in the state and that minerals cannot be collected at random. Prospecting and mining rights at most of the mineral occurrences are granted to third parties and their rights should at all times be respected. At some of the localities local miners sell mineral specimens. 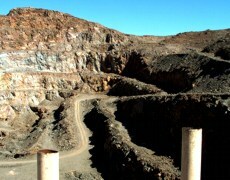 Visitors are cautioned to be extremely careful at the abandoned mine workings. The ground conditions are not safe and children should under no circumstances be allowed to wander around on their own. It is recommended to do the trail in the company of at least one other vehicle or to use the services of local tour guides. GPS coordinates and an information guide is available at the Tourist Bureau. East of Mile 72 several east-striking pegmatites contain rose quartz. Rose quartz is found in pods and lenses up to several cubic metres in volume. Strathmore South is an old worked-out tin mine and no longer in use any more. The hole eventually filled up with ground water, which apparently has healing properties. Nothing is however known about the content of the water and if it is safe at all. Visitors are cautioned to be extremely careful as the ground conditions are not safe and children should under no circumstances be allowed to wander around on their own! 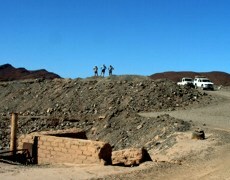 Southwest of the Brandberg Complex in southern Damaraland, at the Villet Mine in the Orawab River, green varieties of tourmaline occur as small crystals in a pegmatite, up to 3 cm long. They have accumulated in nearby alluvial deposits, from where they are occasionally mined.